Being cooped up indoors most of the winter means my girls are itching to run around and jump on everything from the couch to my bed! But with so many fun movement songs for toddlers on YouTube, it can be easy to keep the energy contained to just the living room (or at least the vicinity). It also means mom gets a little cardio in her day! Here are 10 really fun movement songs for toddlers on YouTube that your child will love. If you would rather watch all 10 of the songs at the same time, I made a playlist with all the songs! You can shuffle them or put the playlist on repeat so the kids stay active even longer. The total time of all the songs is about 26 minutes. I recommend turning the videos on and turning off the monitor on your computer or your TV (if that’s possible) so your kids will concentrate more on moving around than watching what is on the screen. 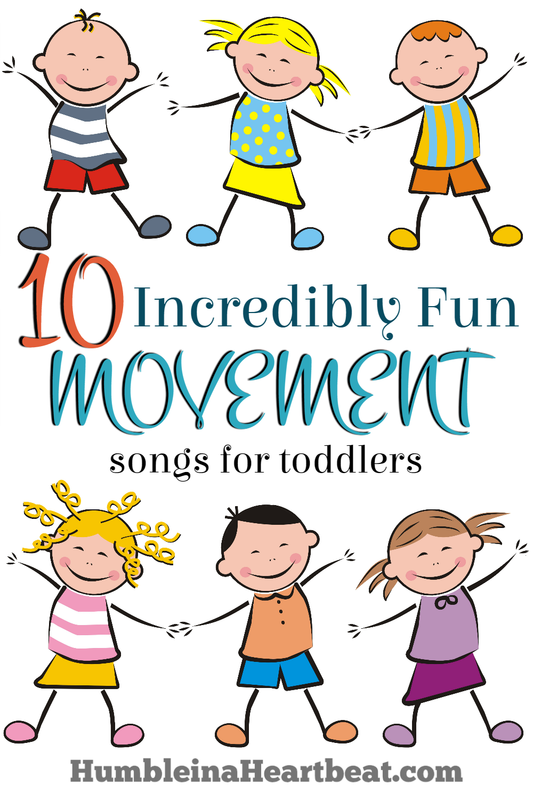 I love to get involved when we turn on these movement songs because it really helps me connect with my kids more. Every once in a while I will let them use the cushion from our rocking chair to jump on (we take it off the chair and put it on the floor), and they love to take turns jumping on it or even pretending to fall over. Anything goes when kids start moving and shaking!! Link to your favorite movement songs in the comments below! I like the Hokey Pokey. I have observed that my kids used to love it too. We love to get up and move with music!! Thanks for including a couple of our songs on your fun list. Love the songs. Added the playlist. All songs children can easily learn and join in. Thanks for sharing! We’d love to see you add The Milkshake Song and Baby Shark! I teach two year olds! Sleeping Bunnies is a favorite one of theirs! So glad you like them, Celeste!